Little Fish is playing hide-and-seek with his friends! Little Fish is playing hide-and-seek with his fishy friends. Can you find him? 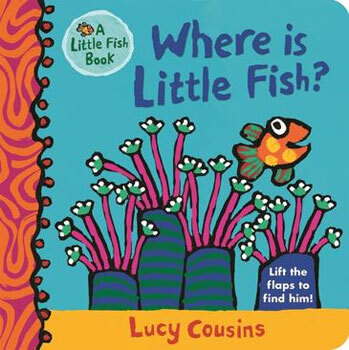 Babies and toddlers will love searching for Little Fish behind the coral, beneath the shell and inside a treasure chest. This gorgeous lift-the-flap book features the vibrant artwork of Lucy Cousins, multi-award-winning creator of Maisy. The colourful flaps are big and sturdy, perfect for little hands. First introduced in Hooray for Fish!, Little Fish is a spotty, playful fish who loves to splish and splash with his friends. He loves Mummy Fish best of all, who's always got time for a kiss!